The experiment described here investigates Rossby waves generated by flow over a barrier on a beta plane. 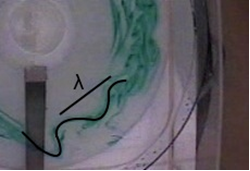 On the left of Fig.1 we see dye streaks revealing the trajectory of fluid parcels as they traverse a barrier. In the lee of the barrier anticyclonic vorticity is generated and thence a train of Rossby waves, as described in Holton (Fig.4.9), reproduced on the right of Fig.1. Fig. 1 (Left) Dye streaks induced by flow impinging on a barrier on a beta-plane in the laboratory experiment. 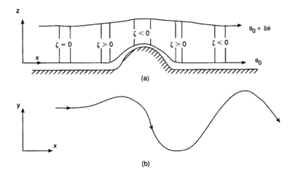 (Right) Fig.4.9 from Holton (2004) considers a Taylor Column being squashed as it traverses a ridge, generating anticyclonic vorticity in its lee, and thence a train of cyclonic and anticyclonic vorticity, much as observed in the laboratory experiment.